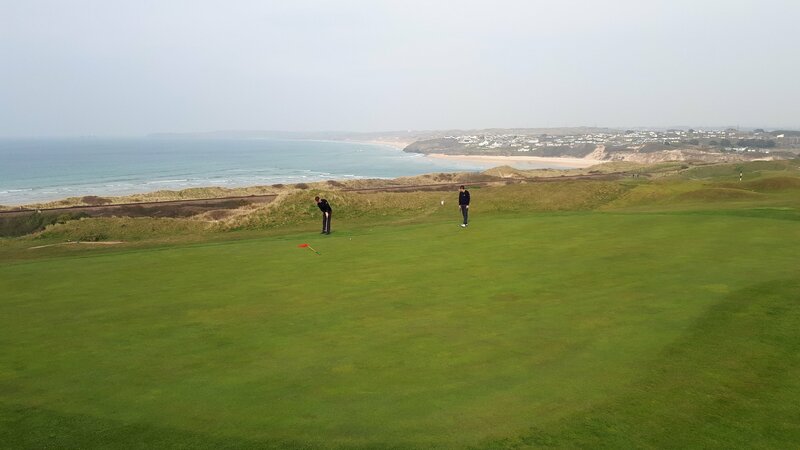 There was a disappointing start to Cornwall’s 2019 Channel League season yesterday as the Duchy Men’s team - runners up last year - went down 9 - 6 at home to 2018 champions Gloucestershire in a match played at West Cornwall Golf Club on a cold and overcast April day. The visitors, and defending champions showed full respect to the home team challenge by visiting Kernow with a team that was fully loaded with their star names, two of whom would lead the way in the foursomes in the shape of Nick Day and Joe Long, who were four-under par in beating Rob MacGregor and Conor Wilson on the 14th hole. The Newquay pairing of Aaron Stephens and Jon Hancock levelled the score-line with an 18th hole win (2 up) before Sandy Kirton & Kieran Faulkner edged Cornwall ahead with a fine 2&1 victory having been behind for long periods of time. Gloucester won an unlikely point in the fourth game when Matt Richards & Joe Reynard squandered a five-hole lead through six holes to eventually lose one-down, and the scores remained level as the teams took lunch when Richard Jasper & George Leigh battled for a hard fought half a point having been two-down for the opening nine holes. Gloucester showed their champions pedigree when they took command of the first three singles matches after lunch, with Long accounting for Richards (3&2), Day beating MacGregor by the same score; in the process playing the back seven holes in five-under par, and Jake Phillips beating Kirton 6&5. The rot was stopped by Wilson in bizarre fashion. Standing at 6-down on the seventh tee, the never say die attitude that has seen Wilson win two County Championships and four Cornish Closed stroke-play titles saw him birdie the 13th, 16th and 18th holes for a half point, which was followed by impressive wins from the young contingent; first with Leigh on the 16th hole and then Reynard on the 15th hole. The comeback was to be short lived however as Charlie MacLean beat Faulkner (5&4) and when Josh Denley defeated Stephens, Gloucester had secured victory by reaching the eight points required for a guaranteed win. Jasper put a dent in the total by once again exhibiting the form that saw him go unbeaten in the Channel League last year with a fine 17th hole victory over Noah Hessey before Hancock was unlucky not to gain a further half point. Playing the 18th hole he made a birdie three only for his opposition, Tom Workman to follow him in for a birdie of his own with a putt from 20 feet. The final result was a 9 - 6 victory for Gloucester and in the after match speeches Cornwall Captain, Ian Veale, praised the Gloucester Captain and his team on a fully deserved victory. 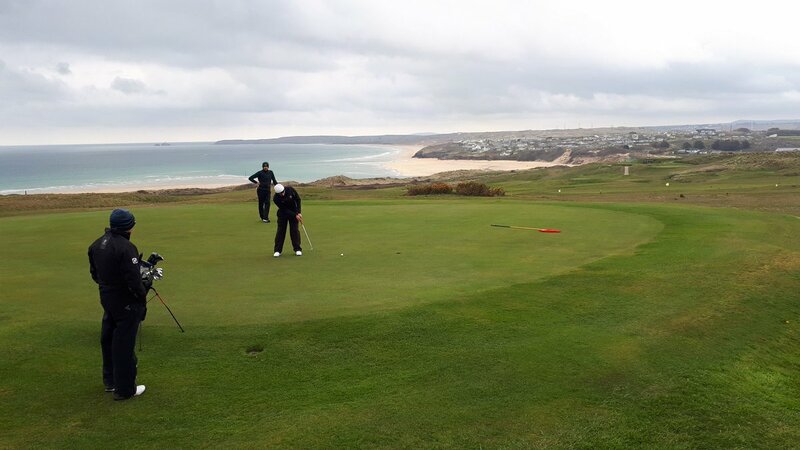 Both Captains thanked West Cornwall Golf Club for their outstanding hospitality, which encompassed the condition of the golf course together with the sustenance from the kitchen. Cornwall will next line-up against Gwent at Llanwern on the weekend of 27/28 April when Veale will be looking for his team to bounce back from this opening defeat, despite the fact that he will be without five of the team playing yesterday. County Captain Veale may well have to pull on the county jersey again. Elsewhere yesterday Somerset – who finished third last year – rallied from 3 ½-1 ½ down at High Post to pip hosts Wiltshire 8-7.